It's a drizzly day at PAETECPark, just two days before the brand-new stadium celebrates its June 3 grand opening with a Rochester Rhinos soccer game. But tonight the men are nowhere to be found. Tonight, the women rule the turf. The members of the W-League Rochester Rhinos women's team go through their daily paces under the watchful eye of head coach Rene Rivas, the recently retired Rochester men's star. The women are coming off their first win of the year --- a 2-0 road victory over Sudbury, Ontario --- so today, despite the generally rotten weather, spirits are high among the Rhinos women. "We're just getting used to the field," midfielder/forward Jacquie Lacek says after practice. "It's bigger than what we're used to. It's taking time for us to click and come together." But that process is moving swiftly along. Says forward/midfielder Rachel Kruze: "We're starting to gel, to come together." Currently in their first year of existence, the Rhinos are hoping to eventually duplicate the success of their male counterparts and become a dependable draw for fans. 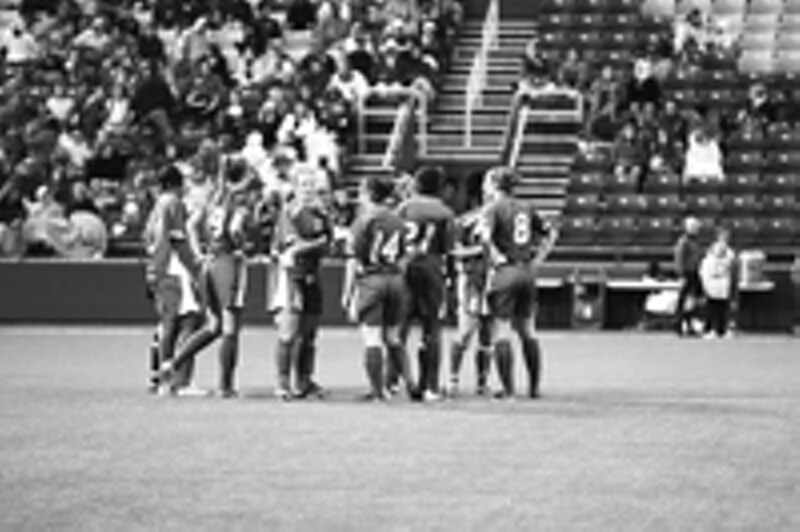 The team, which succeeds the Rochester Ravens as the city's premier women's soccer unit, is owned by the same ownership group that runs the men's squad. However, one key difference exists between the men's and women's teams --- the men get paid and the women don't. Even though it's now the top level of soccer for women in America (following the demise several years ago of the professional WUSA), the W-League is strictly amateurs only, which presents a challenge for the league's 38 teams when they try to recruit players. However, the Rhinos have done a fairly good job of attracting top talent. Perhaps the team's highest-profile player is the 24-year-old Kruze, a Rochester native who formerly played in the WUSA and in professional leagues in Iceland. She'll be counted on to lead the squad, but Kruze says neither she nor the team as a whole feels an excessive amount of pressure. "We're a new team, so we're going out to play the best we can," she says. "There's no pressure on us. We're just looking forward to showing people how good we are." The task of molding the first-year team falls to Rivas, a native of Brazil who became a fan favorite with the Rochester men's team. He echoes Kruze's sentiments, saying that there's no pressure for the Rhinos to earn the W-League title in their inaugural year. That doesn't mean, however, that he and the players aren't shooting for it. "You need a goal, and my goal is to win all our games," he says. "If we do that, we can become champions. I want them to believe that they can be part of an organization that wins. To compete is OK, but to win is the best." An undefeated record was certainly a tall order, and it's not going to happen this year. As of Monday, the Rhinos were 1-3 after a 2-1 loss to the Laval, Quebec, Cometes in Rochester's home opener Friday at PAETECPark. Still, there's reason to be optimistic about the rest of the Rhinos' 2006 campaign. They're young --- the oldest player is only 24 --- fit and relatively fast, strengths on which they're trying to build. In addition to racking up wins, officials for both the team and the league are looking to the Rhinos to generate enthusiasm for girls' and women's soccer locally and become a reliable draw at the gate. W-League director of operations Kristin Lettiere says the October purchase of the Rochester women's franchise by the Rochester Sports Group --- which also owns the men's soccer team as well as the Rochester Rattlers (outdoor lacrosse), Knighthawks (indoor lacrosse) and Americans (hockey) --- is an encouraging sign. "For them to take over the women's side can only boost the level of women's soccer overall," Lettiere says. "Now you can start to tap into the women's potential. [Local women and girls] now have their own role models and will see possibilities for themselves as well." And so the women set about their task. As the Rhino women practice in the misty rain, the members of the Rattlers begin to gather for their practice. While the lacrosse players wait at the edge of the field and watch the women engage in a high-spirited scrimmage, some of the men comment on how physical the women are getting, and the men are impressed. Says one Rattler: "These girls are tough." Tough enough to practice in the drizzle, tough enough to take on 37 other women's teams and tough enough, at present time, to rule the turf. The Rochester Rhinos women's team plays the Vermont Lady Voltage Friday, June 16, 7:30 p.m. at PAETECPark, 460 Oak Street. Tickets cost $8-$18. For a season schedule or more information visit www.rhinossoccer.com or call 454-KICK.